A father who caused the death of his tiny baby son at their home in Midhurst has been jailed. His dad Christopher Barnes was convicted on Monday of manslaughter and inflicting grievous bodily harm after a trial at Lewes Crown Court. Barnes, 28, of Barlavington Way, Midhurst, had claimed he was not responsible for what happened to Harry and always held him properly. He was jailed today for six and a half years, the court confirmed. 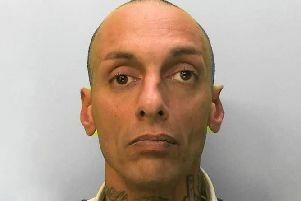 Barnes appeared at Lewes Crown Court for sentencing today. Mrs Justice Ingrid Simler DBE - who was the judge throughout his trial - was the one who passed sentence. Barnes was sentenced to six and a half years in prison for the manslaughter charge, and two years for inflicting grievous bodily harm. The sentences will run concurrently, giving a total sentence of six and a half years. Following the conviction, Harry's distraught mum Laura Millins said she 'finally has the truth'. Throughout the trial Barnes denied the offences, saying he knew how to safely hold Harry. Barnes replied: “It wasn’t me. I never hurt that little boy. He meant the world to me." An NSPCC spokesperson said: “Whilst the magnitude of what he did will no doubt weigh heavy on Barnes’s shoulders, the repercussions of his actions will have a long-lasting and devastating impact on a family robbed of the chance of watching Harry grow up. “Babies can be demanding but it is important that those caring for them reach out and seek help if they are experiencing difficulties.